The Flash is back and all is right with the world—or so the opening minutes of the season premiere would have us believe. Our hero faces off with familiar enemies Captain Cold and Heat Wave, and takes them out with the help of Firestorm. Everyone is all smiles back at STAR Labs: Caitlin and Ronnie are now married, Doc Stein has joined the team, Joe and Iris are there, and…Eddie and…Harrison Wells…uh-oh. This can’t be right. Granted, it would be a little odd for season two to launch with such high spirits, given the events at the end of last spring’s finale, most notably Eddie sacrificing himself to save everyone from the Reverse-Flash. Still, it’s a bit of a downer to cut away from this dream/fantasy to find Barry working alone six months after the singularity, reciting his opening spiel about being the fastest man alive in a resigned, weary voice. While it’s certainly necessary for the show to grapple with the aftermath of Eddie’s death, this sort of “I must go it alone” storyline is all too familiar (I’m pretty sure Arrow has done it almost a dozen times by now), especially when we’re pretty sure the whole gang (or at least the living members thereof) will be back together by episode’s end. For now, though, they are scattered. Cisco is working with Joe’s new Anti-Metahuman Task Force, although much to his chagrin he hasn’t been given a badge. Caitlin is now working at rival Mercury Labs, and Ronnie, we learn in flashback, is the real man who saved Central City. The singularity cliffhanger from last season is resolved when the Flash stabilizes the wormhole while Firestorm merges the event horizons, causing it to close. Barry is able to rescue Stein but not Ronnie, who is presumed to be dead by those who know him if not by those of us who have read comic books before. As far as the rest of Central City is concerned, however, the Flash is the man who saved it. Barry reluctantly attends a Flash Day rally (complete with foam lightning symbols, t-shirts, and red-and-yellow balloons) in order to accept the key to the city from the mayor. The festivities are disrupted by the arrival of a new villain, who I at first took to be Bane, but turns out to be Atom Smasher (as named by Stein, not Cisco this time). A radiation-powered metahuman who is a dead ringer for a recently murdered nuclear power plant worker named Al Rothstein, Atom Smasher is a particularly cartoonish foe who expands as he absorbs radioactivity. 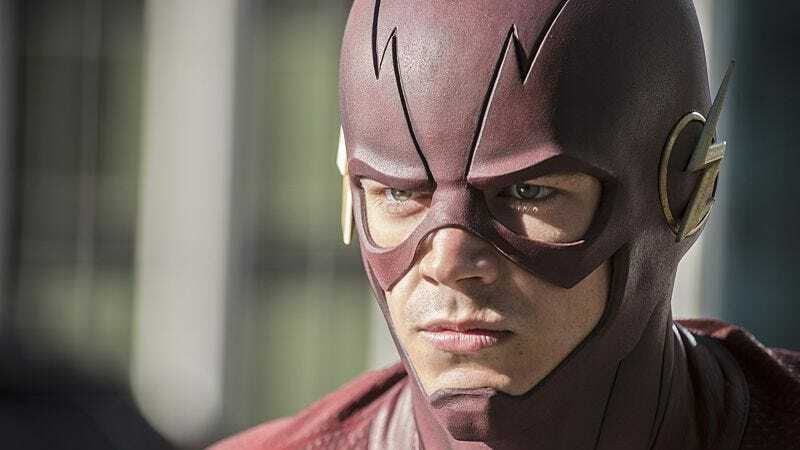 His real purpose in the episode is twofold: In the short-term, to teach Barry that he needs the help of his friends so the whole gang can reunite to take him down, and in the long-term, to set up this season’s parallel worlds arc. This Al Rothstein, it is strongly implied, is not from our Earth; he’s been sent by someone named Zoom to kill the Flash. Atom Smasher is easily dispatched once Cisco has the idea of overloading him with too much radiation to absorb, but it becomes clear that he was merely a harbinger of a much larger threat when a stranger named Jay Garrick shows up at STAR Labs to warn our friends that their whole world is in danger. This is what we’ve been waiting for since that helmet rolled out of the wormhole last season, and we’ll have to wait just a little bit longer. As a whole, “The Man Who Saved Central City” plays as a housekeeping episode; a bit of throat-clearing before the real fun starts. That’s especially true when Barry views a recorded message from Harrison Wells, who has left him STAR Labs on the condition that he watch this final transmission. It turns out that his recording is a confession that frees Henry Allen from prison, but what should be a moment of triumph is undercut by Henry’s too-convenient decision to get out of town (as well as by X Ambassadors’ overplayed “Renegades” threatening to turn the welcome-home montage into a Jeep commercial). While it’s understandable that Greg Berlanti and company would be wary of upsetting the balance of the ensemble by adding Henry to the regular mix, his explanation for splitting so soon after being freed from Iron Heights isn’t especially convincing. I’m sure John Wesley Shipp will continue to make occasional appearances, but the abruptness of his departure only adds to the sense that “The Man Who Saved Central City” is an episode designed to clear the decks for season two. After a long, Flash-free summer, however, even a transitional hour makes for a welcome return to this world. With next week’s episode titled “Flash Of Two Worlds,” I have a feeling things are about to get really crazy. In the first season episode “Power Outage,” Al Rothstein was said to have been killed in the particle accelerator explosion, but tonight Cisco says he was on his honeymoon in Hawaii at that time. Temporal shenanigans or good old-fashioned continuity error? 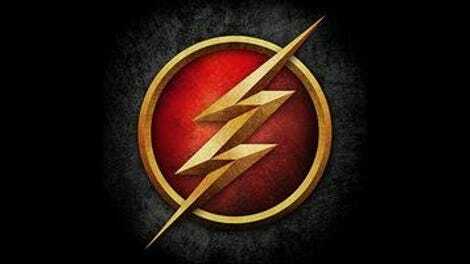 Cisco got the idea for the Flash signal from a comic book. Wink-wink, nudge-nudge, please don’t do that again, show. On the other hand, I didn’t mind them hanging a lampshade on the bad security at STAR Labs. I mentioned that enough times last year to be glad it was finally addressed.